My Cup Runneth Over: Christmas Cupcakes, Anyone? Yummy! I just LOVE cupcakes, and these ones are the best kind of all.....no calories but all the sweetness! There's just something about this color combination that gives the feeling of soft, sweet Christmas goodness. Topped with glitter and dripping with sweet sequins and seam binding. You can't gain any weight with these cupcakes, so why not indulge yourself? I created this sweet card using white card stock covered with a piece of vellum to add a soft, muted feel to the background. Next, I attached two strips of patterned paper that I inked and laid on the vellum vertically. 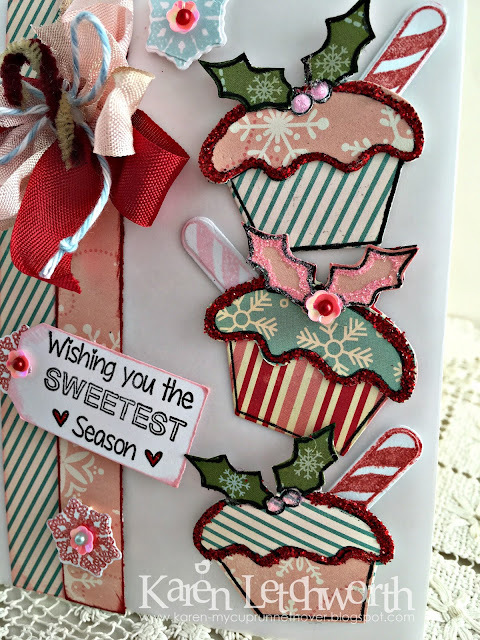 I stamped the cupcakes onto patterned paper using a Paper Sweeties stamp set called Homemade With Love by paper piecing it together and adding red glitter to the edges. I also used the coordinating Homemade With Love Sweet Cuts (die-cut set). The candy sticks, snowflakes and sentiment are also from this same set. I placed tiny adhesive pearls into the centers of some Bubblegum Sequins as accents to the cupcakes and snowflakes. And, as I almost always do.....I couldn't resist adding a sweet ribbony bow to my card. So, I used some Lipstick Red Seam Binding, Cotton Candy Seam Binding, and Teal Baker's Twine to create my bow, and I topped it with a sweet little Red & White Chenille Candy Cane that I "inked up" to give it a vintage feel. I'm SO excited for Christmas to come, and I'm really enjoying decorating the house, baking cookies, and best of all.....the anticipation of having our married daughters and their husbands come visit us. Now I know how my own Mom feels when we aren't able to be with them during the Holidays. We just have to make the most of the time we have. It's all so precious, and slips by much too quickly. 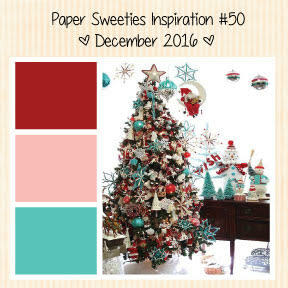 We warmly invite you to stop by Paper Sweeties to play along in their December Challenge using the inspiration photo above. One lucky person will win a $100 gift certificate to spend in their sweet shoppe, and there's lots of great inspiration as well as a fun blog hop. I hope you've enjoyed your visit to my blog today. I appreciate you stopping by, and I hope that you will pop back by again soon. Enjoy your December, and.......maybe a cupcake or two! 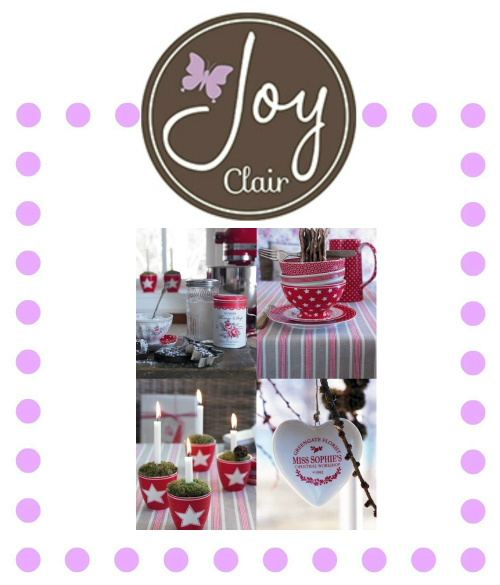 Joy Clair December and January Challenge - I love this sweet inspiration photo, and using traditional Christmas colors along with non-traditional colors is so much fun. 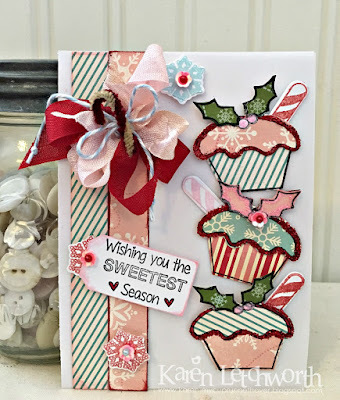 Simon Says Stamp Wednesday Challenge - Simon Says "Anything Goes" - I love when there's any Anything Goes theme, and I'm happy to share some projects in this challenge. Aud Sentiments Challenges - Anything Goes With a Sentiment - I stamped my sentiment, a well as most of my card. Lots of fun! This is gorgeous! LOVING those stacked cupcakes!!!!!!!!!!!!!!!!! Love those sweet cupcakes with the pretty patterned papers!! Awesome snowflakes and wonderful ribbon treatment, too!! 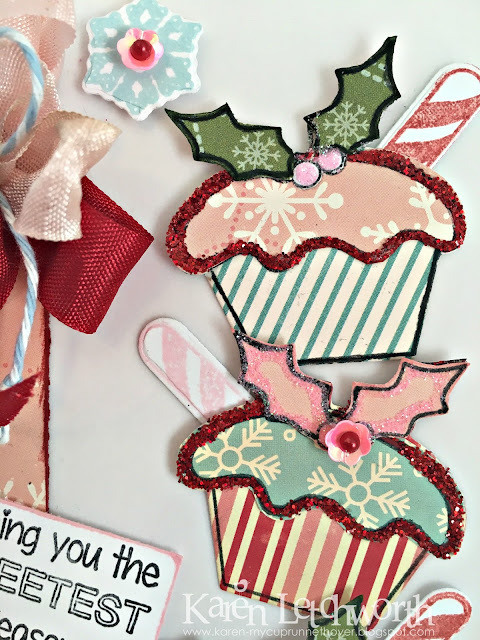 Thanks so much for being guest designer for Paper Sweeties!!! Like the yummy cupcakes with the wonderful layers of papers & sparkle. Wonderful cupcakes there Karen, and it wasn't an easy challenge, in my mind red and pink don't go, so well done on pulling it off! OMG!!! Karen, these cupcakes are lovely!!! The papers you used are so much fun!!! This is absolutely beautiful. Love those cupcakes!! I'm so glad your daughters and their husbands will be able to be with you. Our kiddos will be home for visits this month. AND their visits will overlap for two days. It will be so nice to have them home at the same time. Hugs!! Great Card Karen and what a super challenge!! hi karen! this is an amazing card, luv the colors and patterns! I am so glad you played along with us at simon says stamp wednesday challenge! Beautiful card. I love the paper piecing. So glad you shared over at Aud Sentiments. Karen this is gorgeous - love the layout, the colours and the gorgeous glitter. Your card is lovely. That color combo makes a fun Christmas card. You absolutely blow me away, and when you use Paper Sweeties' products, you absolutely ROCK them and inspire me to buy things I might not otherwise try. You really get me going creatively, and I SO wish you were on this DT. Thanks for inspiring me so much. Fabulous project!!! I love every detail so much!! Merry Christmas and God bless all your family! !